Explanation: Earth's annual Geminid meteor shower did not disappoint as our fair planet plowed through dust from active asteroid 3200 Phaethon. Captured in this northern hemisphere nightscape, the meteors stream away from the shower's radiant in Gemini. To create the image, 37 individual frames recording meteor streaks were taken over period of 8.5 hours during the night of December 12/13. In the final composite they were selected and registered against the starry sky above a radio telescope dish of MUSER, a solar-dedicated radio telescope array at astronomically-named Mingantu Station in Inner Mongolia, China, about 400 kilometers from Beijing. Sirius, alpha star of Canis Major, shines brightly just above the radio dish and the Milky Way stretches toward the zenith. Yellowish Betelgeuse is a standout in Orion to the right of the northen Milky Way. 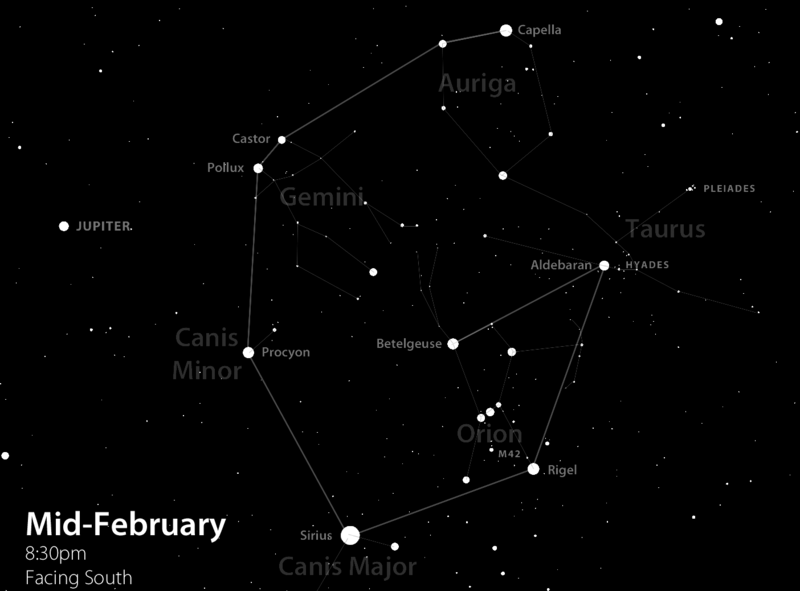 The shower's radiant is at top left, high above the horizon near Castor and Pollux the twin stars of Gemini. The radiant effect is due to perspective as the parallel meteor tracks appear to converge in the distance. Gemini's meteors enter Earth's atmosphere traveling at about 22 kilometers per second. So this is a composite image. That's very good to know! Now we don't have to discuss if the picture is "real". Personally I just love the portrait of the winter Milky Way and the "Winter Pentagon", or what is it called? Perhaps it is called the "Winter G"? Anyway, all the bright and important stars are here, beautifully colored too: Sirius, Procyon, Betelgeuse, Aldebaran, Capella, Castor and Pollux. I guess we're missing Mirfak, but you can't have everything. And then there is of course the rest of Orion, the Hyades and the Pleiades, and I guess that's the Beehive Cluster, M44, at far left, being streaked by a meteor. The beautifully pink aptly named Rosette Nebula is located above Sirius and to the left of Betelgeuse, and the California Nebula is seen at about 1 o'clock. How do photos collated/collaged over 8.5 hours only have one radiant point? Guest wrote: How do photos collated/collaged over 8.5 hours only have one radiant point? In the same way that the background stars are not blurred -- a motorized mount is moving the camera so that it tracks the apparent sky movement, thus keeping the radiant in the same apparent location within the field of view.. Correct me if I'm wrong, but all meteor showers have one radiant point. The Earth spins, the heavens don't. The satellite dish would have moved against the sky background in 8 hours, so I would think the satellite dish in the picture was not a composite but just one image as opposed to the meteor shower. Thanks, Ann, for pointing out those other key points in the photo. Some of us have been so long out of the loop, we have forgotten much of the starry magnificence. Great pic! Indeed, the standard method used for taking tracking sky shots that include landscape features is to use a single image of the landscape combined with the tracked sky. Ann wrote: Personally I just love the portrait of the winter Milky Way and the "Winter Pentagon", or what is it called? Perhaps it is called the "Winter G"? 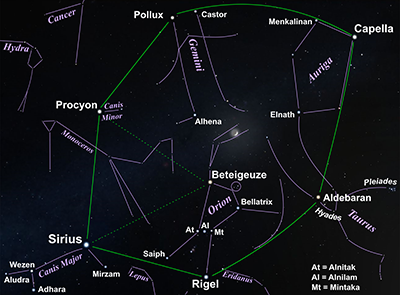 The Winter Hexagon is an asterism appearing to be in the form of a hexagon with vertices at Rigel, Aldebaran, Capella, Pollux, Procyon, and Sirius. It is mostly upon the Northern Hemisphere's celestial sphere. On most locations on Earth (except the South Island of New Zealand and the south of Chile and Argentina and further south), this asterism is prominently in the sky from approximately December to March. APOD Robot wrote: Gemini's meteors enter Earth's atmosphere traveling at about 22 kilometers per second. Actually, their speed is 35 km/s, which is about 22 miles per second. Gemini's meteors enter Earth's atmosphere traveling at about 22 kilometers per second. But if it wasn't for this discrepancy Gemini's meteors might have missed Earth's atmosphere entirely! <<The Mars Climate Orbiter (formerly the Mars Surveyor '98 Orbiter) was a 338-kilogram (745 lb) robotic space probe launched by NASA on December 11, 1998 to study the Martian climate, Martian atmosphere, and surface changes and to act as the communications relay in the Mars Surveyor '98 program for Mars Polar Lander. However, on September 23, 1999, communication with the spacecraft was lost as the spacecraft went into orbital insertion, due to ground-based computer software which produced output in non-SI units of pound (force)-seconds (lbf·s) instead of the SI units of newton-seconds (N·s) specified in the contract between NASA and Lockheed. The spacecraft encountered Mars on a trajectory that brought it too close to the planet, causing it to pass through the upper atmosphere and disintegrate. Clicking on picture and magnifying is cool... M42, the Pleiades, and others look good. Thanks for setting me straight, Case! No, the U.S. Department of Defense has not opened a branch office in the sky! But I was not entirely wrong about the "Winter G", as you can see!